In a celebration of the rights of children, the 2014 Nobel Prize for Peace has been awarded to Malala Yousafzai, shot by the Taliban for going to school in Pakistan, and Kailash Satyarthi, who has been campaigning against child labour in India for more than 20 years. Announcing the award, committee chairman Thorbjørn Jagland described it as a recognition of “their struggle against the suppression of children and young people and for the right of all children to education”. Coming the day before International Day of the Girl Child, the committee’s recognition of that struggle is an opportunity to reflect on a number of recent incidents – such as the mass abduction of nearly 300 adolescent school girls from their boarding school in northeastern Nigeria by Boko Haram – that have highlighted the plight of adolescent girls in many parts of the world. Development practitioners and donors are more than ever convinced that increasing opportunities, skills and resources for women and girls will lead to measurable improvements across a wide range of development indicators and for all people, irrespective of their gender. The running assumption is that targeting adolescent girls is one of the most effective strategies available to achieve wider developmental outcomes. In line with this thinking, myriad interventions around the world are being designed and trialled to specifically target the plight of adolescent girls. 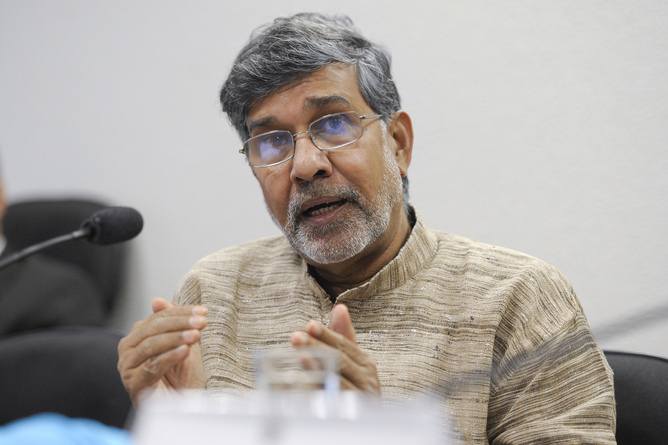 …and her co-laureate, Kailash Satyarthi. But as the number of effective and successful adolescent development programmes multiplies, we are also likely to see an increasing number of contradictions in development indicators. We can expect opportunities and skills for women to improve noticeably in some areas – but they will also be constrained and circumvented in others. The reason is that the lives of girls in patriarchal societies are defined and constrained by multiple norms, regarding education, marriage, childbearing, employment, and so on. That means that a “successful” change in one aspect of their lives (such as better access to schooling) need not automatically lead to changes in norms relating to, say, their marriage or employment. A great example of this effect is the female secondary school stipend programme in Bangladesh, introduced in the 1990s to give girls incentives to remain in school for longer. Its introduction made it normal and acceptable for girls in rural Bangladesh to attend secondary school, a practice that previously was widely frowned-upon and resisted in more conservative communities. Since the programme began, female secondary school enrolment has risen dramatically in Bangladesh, overtaking the level attained in neighbouring Pakistan and achieving parity with the male enrolment rate, a goal which still eludes India. So far so good – and yet, Bangladesh remains one of the countries with the highest rates of child marriage in the world. While parents in rural Bangladesh are much more likely to send their adolescent daughters to school today than they were 20 years ago, a good marriage proposal can still bring an end to their schooling experience. The schooling norm has changed – but only to the extent that it does not conflict with the early marriage norm. We have just completed a nationwide survey of more than 6,000 women in Bangladesh, funded by the Australian Department for Foreign Affairs and Trade, and we found that more than 60% of women between the ages 20 to 24 were married by age of 18 – little has changed from figures reported over the past 15 years. Nearly three out of every four who were married by 18 reported in our survey that parental pressure was the main reason for their early marriage. During the survey, we travelled to the industrial city of Naranganj and met Rebeka, whose life story epitomises how strong entrenched gender norms remain – even as educational and work opportunities are expanding rapidly for Bangladesh’s women. The youngest of seven children of a small farmer, Rebeka was forced into an early marriage, arranged by a distant relative, after just two years of schooling. She first came to Naranganj 12 years ago, and initially found work in the ready-made garment factories that export cheap clothing worldwide. But her husband disapproved of the work environment – and, as she put it: “People would say bad things’ about her working in a factory”. She quit her job after six months. The social pressure she experienced while working in the garment sector has shaped her perception of it. Rebeka told us she would never allow her daughter to work there, even though the sector employs more than 3m workers, mostly women, and provides one of Bangladesh’s fastest-growing exports. Rebeka’s life experiences in Narayanganj might seem far removed from the violent examples mentioned above. But just as Boko Haram’s kidnappings in Nigeria and the Taliban’s actions in the Swat valley in Pakistan drew the world’s attention to the strength and organisation of these radical groups, they should also remind us that archaic and powerful gender norms can lurk in the shadows – even in a world where opportunities for adolescent girls are opening up like never before. Traditional views of the role of women continue to shape their life choices regarding education, marriage and employment, even though opportunities may have improved significantly compared to those of the previous generation. The implication is that if we really want to improve the quality of life for adolescent girls in developing countries, we need a multi-pronged approach; we need programmes designed specifically to improve access to schooling, to discourage early marriage and childbearing, to help women develop income-generating skills, to improve security and safety in public spaces and workplaces and to change norms that make domestic violence socially acceptable. Programmes and policies that focus on just one of these goals at the exclusion of others will fail to make a comprehensive difference in the lives of adolescent girls. Malala and Satyarthi have been deservedly recognised – but the struggle goes on. Zaki Wahhaj receives funding from the Australian Development Research Award Scheme (ADRAS) for a project on ‘The Role of Secondary Schooling and Gender Norms in the Long-term Opportunities and Choices of Rural Bangladeshi Women’. M Niaz Asadullah receives funding from the Australian Development Research Award Scheme (ADRAS) for a project on ‘The Role of Secondary Schooling and Gender Norms in the Long-term Opportunities and Choices of Rural Bangladeshi Women’. Thanks Chris: Agree with header, and the Nobel awards selection. Awesome content you post here!